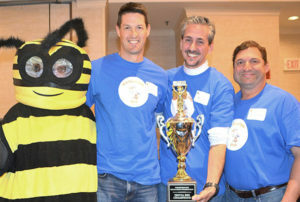 Trivia Bee mascot presents champions’ trophy to Mill Pond Dads: (l to r) Ben Wallace, Adam Halem and Kevin Glassman. Photos/Ed Karvoski Jr.
Westborough – Thirty-six teams of three players figuratively donned their thinking caps Oct. 29 at the DoubleTree by Hilton as they challenged themselves for the 11th annual Trivia Bee, the primary fundraiser of Westborough Education Foundation (WEF). 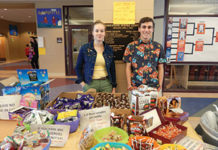 The real winners were Westborough students because WEF has provided over $400,000 in grants in its 21-year history. 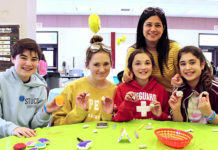 Once again judging the evening’s antics were Westborough community leaders Library Director Maureen Ambrosino, retired Police Chief Alan Gordon and retired Superintendent of Schools Marianne O’Connor. Town Moderator John Arnold served as master of ceremonies. After several tie-breaking questions were posed to two teams, the Trivia Bee champions’ trophy was awarded to Mill Pond Parent Group dads Kevin Glassman, Adam Halem and Ben Wallace. 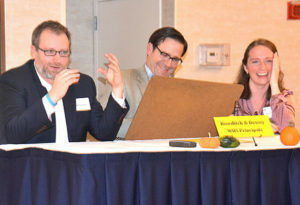 Good-naturedly battling with the champs to the end were Westborough High School’s (WHS) Principal Brian Callaghan with Assistant Principals Jessica Barrett and Matt Lefebvre, sponsored by Bowditch and Dewey. Awarded Best Costumes as a team of Pond Life creatures sponsored by Roche Bros. were Peter Guellnitz, Maura Kovaleski and Jeff Slomski. 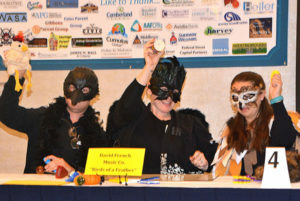 Deemed Most Spirited was the team known as Birds of a Feather with kindergarten to third-grade music teachers John Kinney, Megan McNally and Karin Puffer, sponsored by David French Music Company. Also representing WHS were its Honor String Quartet and a cappella group Don’t Panic performing beforehand, and Redshift 4048 conducting robotics demonstrations during intermission. WEF provides funds for programs not covered by the school budget. 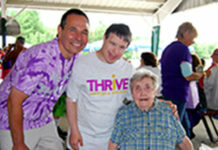 For more information about WEF, visit www.westborougheducationfoundation.com and facebook.com/westborougheducationfoundation. 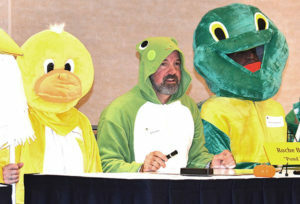 Winning Best Costumes are Roche Bros.’ Pond Life teammates (l to r) Maura Kovaleski, Jeff Slomski and Peter Guellnitz. Demonstrating why they’re Most Spirited team are K-3 music teachers: (l to r) John Kinney, Megan McNally and Karin Puffer. Tackling a tough question are (l to r) Westborough High’s Assistant Principal Matt Lefebvre, Principal Brian Callaghan and Assistant Principal Jessica Barrett. 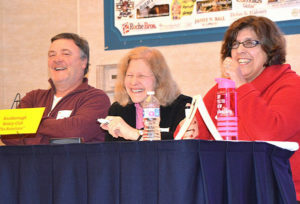 Sharing a laugh while competing as one of six finalist teams are Rotary Club of Westborough members (l to r) Scott King, Carolyn Spring and Kathy Wilfert. 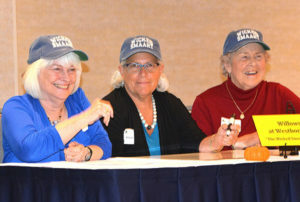 Wearing “Wicked Smaaht” hats are Willows of Westborough teammates (l to r) Sally Weglage, Polly Horenstein and Kay Devlin. 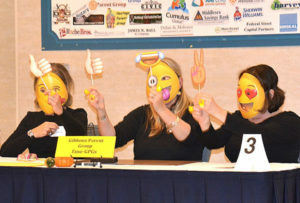 Expressing themselves are Gibbons Parent Group’s Emo-GPGs teammates (l to r) Kelly Petralia, Karen Henderson and Mary McDermott.